The paint still hasn’t dried from the 2009 Auburn Tigers, and depending on who you ask, this past season was a success. The Tigers managed to rebound from a disastrous 2008 season, a questionable hire (3-19 Gene), and a completed rebooted offense to a winning record, a New Year’s Bowl and cautious optimism for the 2010 Season. These aren’t end all be-alls for the Tigers. They should be used and viewed as a good barometer and a measuring stick that this fan at least, can look back and say, “Yep. We’re on the the right track”. When I originally thought about the ten things, I was still under the impression that Auburn would be going to the Independence Bowl or (worse) the Birmingham Bowl. When worked leaked out that Auburn was going to the Outback Bowl, I got excited. Then, when it looked like we would have AU-Wisconsin III, I was tempted to downgrade this from a must, to a hope. Now that its official that it will be AU vs Northwestern that was upgraded from a hope to a huge must. Winning the bowl game ends the skid. Auburn fans shouldn’t forget that we ended the 2008 season losing our final two games (and 5 of our last 7). Winning the Bowl stops that and put a nice bow on the 2009 season. 8-5 looks a heck of a lot better than 7-6. It also creates positive buzz into 2010, sends the Senior class off with a much-needed reward, and definitively answers the question that (for now) Gene Chizik was the right man for the job. Add to that the opponent. It’s one thing to play Wisconsin, a competitor year in and year out. It’s quite another to play Northwestern. Nothing against the Purple Wildcats, but losing to the boys from Evansville hurts a lot more than losing to Wisconsin. Losing to a school that lost to Minnesota, Syracuse, and had some nailbiters against mid-level MAC teams, doesn’t exactly instill confidence in the Auburn faithful. Than again, anything can and will happen on January 1st. Auburn fans aren’t the only people who know we’ve got a great staff here at Auburn. A staff filled with (just off the top of my head) at least 4 potential future head coaches (Thigpen, Malzahn, Trooper Taylor and Jeff Grimes) and one who could sneak back into coaching, with a little help from a couple of strong defenses (Ted Roof). Hopefully I’m not the only Auburn fan who looks at each new Head Coaching vacancy and gives them an eye-ball test to see who from the current staff might get talked about for that job. The Memphis vacancy in particular gave me a bit of a scare. You have to keep these guys around. At least for 2 years. 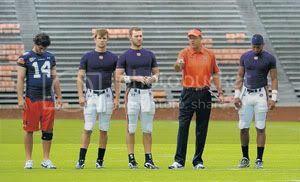 Especially Malzahn, not because of his offense but because we can’t go back to square one again with offense. I’m personally tired of playing musical chairs with offense. In a perfect world, Auburn would add one more coach to the staff and name him Quarterbacks coach. Have him essentially be Malzahn’s Apprentice, learning the O and all the schemes and in the event of Malzhan’s departure, promote him to Coordinator. However, that is more of a 5 year plan. This thinking behind it isn’t unheard of. Just look at Troy. Neal Brown is the youngest coordinator in D-1. Partly by default. He spent 4 years under Franklin’s tutelage at Troy and when the snake oil salesman left, Troy already a guy on staff who knew of O, could run it, and could run it well (some might say better). More than that, it hurts recruiting. The assistants have preached about the family atmosphere and the love at Auburn. What kind of message does it send if the person recruiting them, extolling the virtues of Auburn, isn’t even there to help them move into Sewell Hall? The same goes for these recruits who fell in love with the Malzahn O and the unsightly numbers it can put up. My biggest hope on the recruiting front is that the lead recruiters have sold Auburn first and the staff second. At the end of the day, the staff may leave, but the Plains remain. This one has been coming for a long time. We’ve already seen what the staff can do on the recruiting trail. However, for now, those are just verbal commitments, and verbal commitments can change (as seen today with Antonio Goodwin). I’m not saying Auburn needs a Top 5 Class. However, with the commitments already on board, there is nothing that says Auburn can’t at least have a Top 10 class. More than that, making a Splash on signing day distances the current staff from the current staff. It shows that recruits are buying into the rebuild and brings more national attention to Auburn. This will be the first time, well, ever that I will watch the Army All American game. Ditto for the Under Armour All- American game. Why? Because finally, Auburn will be represented in the game. The main thing, however, is not to look at the stars. Auburn needs immediate playmakers and contributors (especially on defense). These needs have to be met and addressed on signing day. This needs to be done sooner rather than later. Auburn doesn’t need to go in and out of Spring practices without officially handing the reigns over to a QB. Whether that QB is Barrett Trotter, Neil Caudle, or Tyrik Rollison, or the ultimate dark horse Clint Moseley, remains to be seen. I’ll save my personal pick for a later blog post. No matter who the choice is, Auburn should be in good shape. To me, choosing a QB does numerous things, and each of them are positive. Gives the QB a complete year to learn, train, and hone the offense. Develops a rhythm with the WRs NOW, instead of in August. Defines Kodi Burns’s role in the offense. We already know that Kodi is a leader on the team. 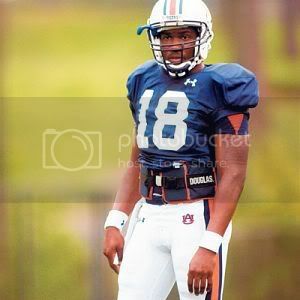 After his, now legendary speach and selfless attitude, he will remain an Auburn legend. One thing all Auburn fans should know by now, also, is that Kodi Burns is not the QB for the 2010 Auburn Team. Personally, I don’t even think he should be the wildcat QB. What throws we did see from him were wild and erratic most of the time. If the Auburn coaching staff wants to make Kodi a WR, then make him a WR full-time. Don’t let him just flirt with the idea of being a WR and still let him practice with the QBs. Keep and develop him at WR. I still think Kodi could make a quite effective possession receiver. He doesn’t have the speed to burn anyone. However, he still possesses the raw talent and toughness to be effective between the hashes as an outlet valve. Numbers 6-10 are coming Tuesday. I agree with you about Kodi. But putting him in at Wildcat added a little element of uncertainty into the minds of the defense. Even when his role got repetitive and predictable, Malzahn used that "predictability" by having Kodi do something new to surprise the defense. Also, there is a bit of diplomacy going on there, as well. The team had been divded about the quarterback situation last year, and this was a way to keep Kodi in the game in a high profile and productive way. It wasn't all window dressing either. Kodi scored many touchdowns for us this year. Mr. Barkley, Kindly Zip It.